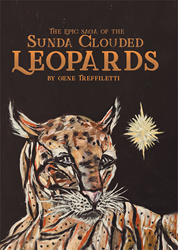 “The Epic Saga of the Sunda Clouded Leopards” from Christian Faith Publishing author Gene Treffiletti is the adventure of five young leopards who develop superpowers after they are adopted by a mother bat. The superheroes must come together in fellowship to stop the evildoers who stalk the streets of Bat City. “The Epic Saga of the Sunda Clouded Leopards” is the creation of published author, Gene Treffiletti. Gene was born in Albany, New York, to parents from Sicily, Italy. He has two older brothers and a younger sister. He also has two sons, who he is extremely very proud of. Both are hard workers, good husbands, and great fathers to their children. His daughters-in-law are truly wonderful in every respect as mothers, wives, and daughters-in-law. His grandchildren are good students, talented athletes, and so much more. Gene Treffiletti grew up with a love of horses, dogs, cats, and almost every other animal, but his passion has always been horses. Published by Christian Faith Publishing, Gene Treffiletti’s new book is a story about a family of five Sunda clouded leopard cubs that have been separated from their mother and father on the Island of Borneo. When the cubs hide in a freshly cut tree, they are accidentally shipped to Texas. Lost and starving in the desert, a bat named Gentivia nurses the young cubs back to health. Raised on the milk of their adopted bat mother, they begin to mutate. The story unfolds as the leopards grow and mutate. They each end up with their own strengths and abilities. The strongest is powered by a star that calls to him, but they are all superheroes who must conquer the notorious pirate “Captain Bok” and the villains that unleash havoc on Bat City. Together, they must find the man responsible for robbing the bank and leaving the people of their town nearly penniless. View a synopsis of “The Epic Saga of the Sunda Clouded Leopards” on YouTube. Consumers can purchase“The Epic Saga of the Sunda Clouded Leopards” at traditional brick & mortar bookstores, or online at Amazon.com, Apple iTunes store, or Barnes and Noble. For additional information or inquiries about “The Epic Saga of the Sunda Clouded Leopards”, contact the Christian Faith Publishing media department at 866-554-0919.